Tuesday saw us spending almost the entire day in the French Concession. This area of Shanghai feels like a step right out of Europe. The streets have beautiful trees lining the way and the buildings are grandiose and colonial in nature. The area also happens to be home to Shanghai's minor Gayborhood. We started the day walking the streets pricing some spas. Spa treatments are big business in China and there were ample opportunities. We tool mental notes and just let ourselves get lost in the area. Every street was just as picture perfect as the next and it is incredible to see shops and people - culture - that is so incredibly Chinese in a very old-style European area. It was kind of amazing. 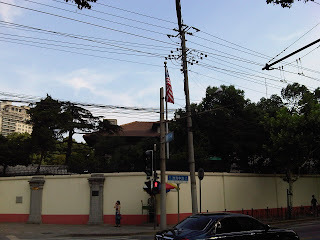 I couldn't help taking a picture of the US Consulate and then got yelled at in Chinese. We ended up having dinner at a Thai restaurant called Kevin's that was listed as a gay stomping grounds. The manager was just all but thrilled to tell us about the restaurant, how it's been under new management for a few weeks and to spread the word about how great it is. I will definitely be spreading the word because it was pretty amazing. Afterwards we did some Tuesday night gay bar hopping. Eddy's was jumping and we had a great time chatting with people there and at Transit Lounge and Shanghai Studios. Incredibly nice people everywhere - easy to make friends and have a good time. The gay scene in Shanghai is so interesting as it feels like a scene in any US city but still with a more underground vibe. It's a really interesting dichotomy. The city is still impressing me and showing me a great time.